Silly putty is a timeless toy that gave me hours of enjoyment as a child. I remember it coming in a red elongated egg shaped container that had the strangest smell. The concept of putty has expanded since I was a child. These days we have silly putty, slime, GAK, Play-Doh, and even play foam. All of these products can be manipulated, folded, squished, and rolled up to form different shapes. Toodie has grown fond of these types of toys so I decided to attempt the re-creation of the classic putty by adding glitter. Everything is better with sparkle! If you do not have this particular glue you can use always use the traditional Elmer’s glue, food coloring, and then add chunky craft glitter for the same effect. The glitter glue is available in several colors including pink, green, blue, purple, yellow, and red. I found mine at Michael’s craft store. 1. In a bowl combine the entire bottle of gitter glue (6 oz.) and 6 oz. of warm water. The amount of water should be equal to the amount of glue, otherwise your mixture will turn out very watery. 2. Mix together with a fork or whisk until glitter glue is broken down and thinned out. Lumps should be removed. 3. In measuring cup add 4 oz. of warm water and 1 teaspoon of Borax. Stir until the Borax is dissolved and water is cloudy. 4. In the bowl with the watered down glitter glue, pour in the Borax mixture. Use whisk to mix as you pour. The faster your whisk the faster your putty will harden. 5. Stir until a flubbery blob is created. You can even use your hands to warm up the putty and get it flexible. Pour out any excess water. If you find that your putty is becoming stiff and not very flexible you can toss it in the microwave for 30-40 seconds to soften up. For storage use an air tight container or large Ziploc bag. You can also give your child different shaped cookie cutters and a rolling pin to play with the putty. Did you happen to notice there are no pictures of the actual Pink colored putty? Through three attempts that included much trial and error it sacrificed itself so I can could finally figure out how to make this stuff the right way! I did promise Toodie that we would make another batch of Hot Pink Glitter putty for her Valentine birthday next month. 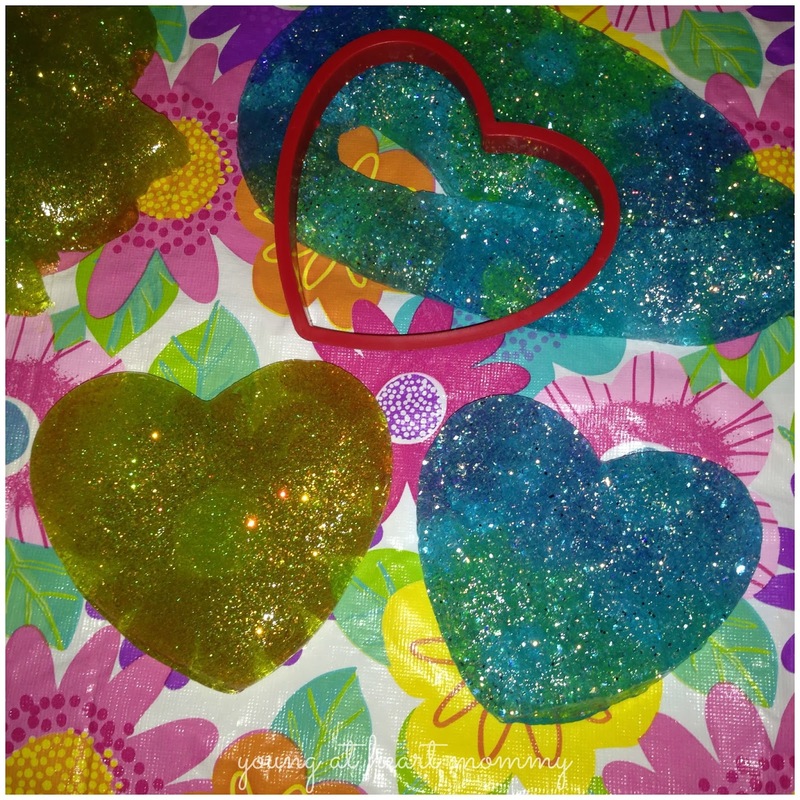 Using small containers you can break the putty into pieces and your child can give them away as little Valentine’s Day favors to friends or classmates. 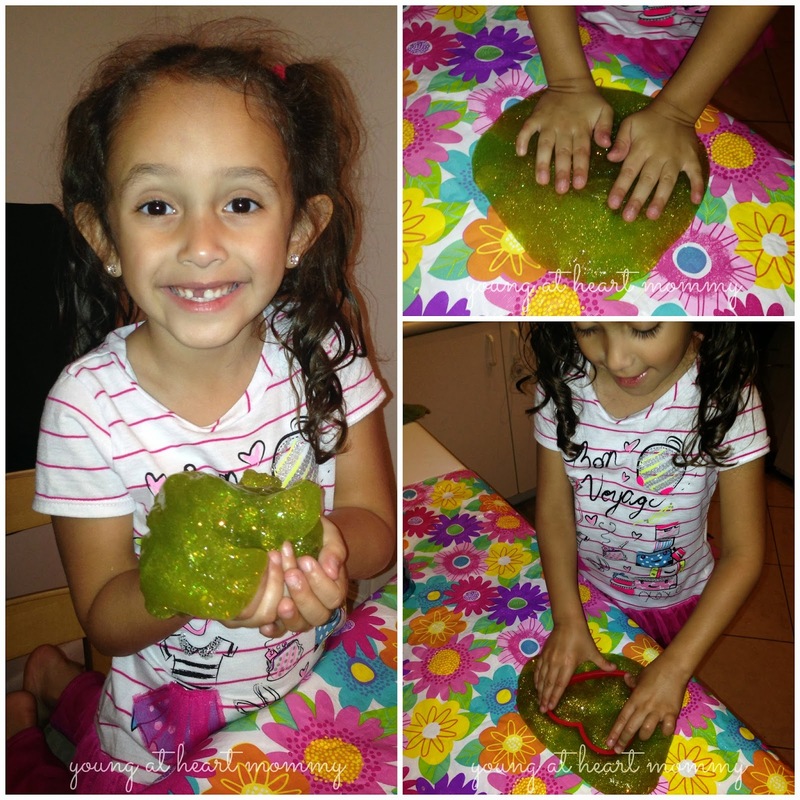 Have you made homemade putty with your children? Play-doh? If you have other fun ideas or homemade creations you would like to share, please do. This is also the perfect rainy day activity to do with your little ones. Minimal mess and hours of fun after! I'm doing this with my Noah this weekend! We've made Play-doh, but not silly putty :) This isn't even expensive to make and it makes a lot! Total winner! Thank you for sharing this and also for the great idea to put it into containers to give to other munchkins! <33 You posted this so quickly from Instagram to here~ you're the bestest!! Oh my gosh, this is SO much fun! My son would have a blast. Oh how I love this!!! I have made "regular" putty, but never with Elmer's Glitter Glue. Thanks for the fun idea! OH my kids would love making this. I love the glitter appeal, we love glitter. I could have so much fun with this! That looks like so much fun. I love all the sparkles! That is SO cool!!! I can't believe how easy that looked to make. Best of all, it doesn't look stringy and sticky like some of the other homemade ones always look. The girls and I were just talking about making silly putty. I never thought to use glitter glue. I am glad I read this post. My kids all like silly putty and I will get all kinds of cool points by making this silly putty. I can hardly stand that I can't reach through the monitor and squish it! It looks like fun! Dude I'm sooooo going to make this! My girls are going to LOVE it!! What a fun craft! I love how excited your daughter looks! Love the glitter too! We love this! 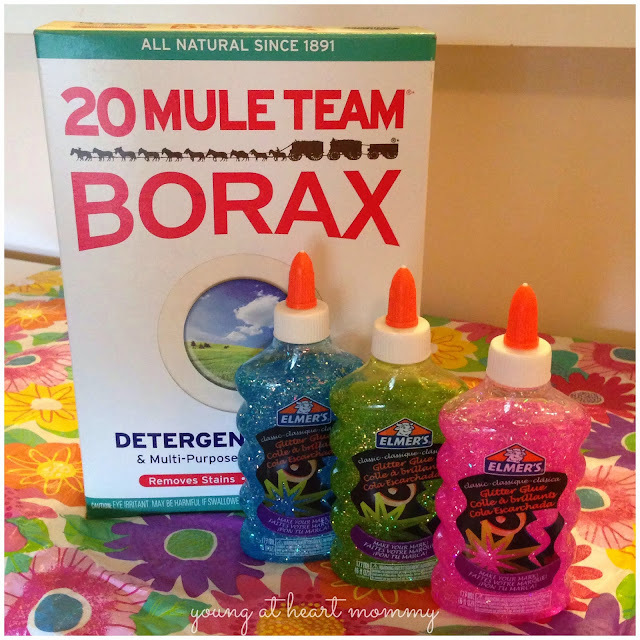 We made green slime last year with our Borax 20 mule~! It lasted quite a while too! I used to love silly putty when I was a kid! 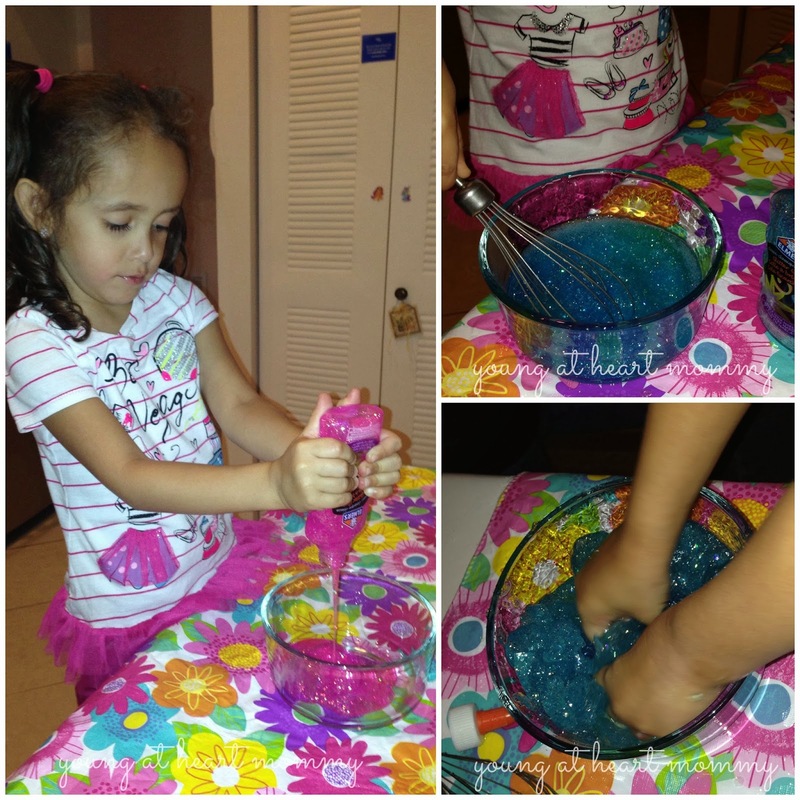 How smart to use the glitter glue to make silly putty! This would be an excellent rainy day craft. What a cute craft idea. My daughter says she really wants to try this with her 4H group of little Cloverleaves. She thinks they will adore it. Thanks for the tip. I never knew this is how you make silly putty! I have everything on hand, I think this will be out crafts for today! 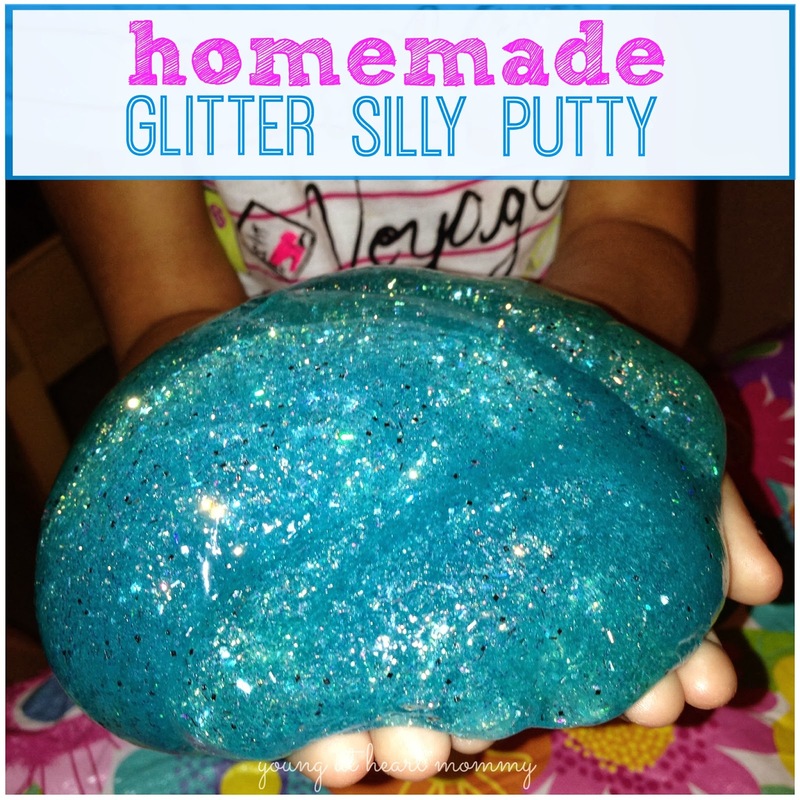 What a great idea to make glitter silly putty! It looks pretty easy to make too - thank you! This looks so cool! I'm pinning this so I can make it with my daughter once we're all over this crud we have. I think the glitter makes this so cool. My grandchildren would love this because anythng that glitters seems to catch their eye. Just might be trying this one soon. I love this idea. My grandchildren would have a lot of fun making as well as playing with this. Thank you for sharing. What a great idea. And I'm sure it will save money as the putty can be expensive. this putty is truly silly it makes me want to be 8 yrs old again. How cool and so easy, and not expensive at all, I love your ideas on how you can use it, too!!! Mine was too loose so we added a bit more borax and that gave the consistency we were hoping to have. Mixed a bit of borax with warm water then added it a bit at a time while working it putty. Firmed it right up. Thank you for sharing. My little one begged for Glitter Putty, so I "Googled" & your wonderful blog came up. Even though I altered the recipe, based on what I could get a hold of that night, it still came out wonderful & amazing. I appreciated the tips. I have been inspired! Thank you for sharing. My three year old little one has become obsessed with Play Doh and Glitter Putty from YouTube videos (it's been the only thing to actually kept her short attention span focused on an actual interest for any period of time). She begged and begged from Glitter Putty, but I did not know where to find it...so I "Googled" and your wonderful blog came up and it was exactly up our alley. Even though I altered the recipe slightly, based on what I could get a hold of that night, it still came out wonderful and amazing. (I had to use food coloring and actual glitter as well adjust measurements.) Even my 7 year old joined in with this new love of Glitter Putty. I also appreciate the tip about warming it, as to help the crumbling effect. After "playing" with it, (it can get a bit addictive for Mommy's too :). ) I found I was prepared to instruct my kids to have a better experience with it knowing your advice. I have also found pressing with your warm palms (not too hard) also helps to rejoin pieces more cohesively, rather than rubbing pieces together, which tend to make it crumble a bit more. Thank you for taking your time to share. I have been inspired! We tried this recipe the other day, but it didn't turn out quite right. I wish I knew what I did wrong. My daughter still enjoys playing with the glittery blob we created, but it isn't as stretchy and flexible as it should be. It breaks when stretched or when kneaded. I even tried warming it in the microwave as one blogger suggested. Any other suggestions? We had to go through quite a bit of trial and error when creating ours. The first batch of pink turned out exactly how you described yours to be. I haven't made this in a while but I would suggest trying 6 oz. of glue and 2 tbsp. of warm water, mixing those together in a bowl. In a separate bowl combine ¾ cup of warm water and 1 tsp Borax. Add this mixture to the glue bowl and use your hands to combine them. Once it starts to firm up just remove it from the bowl and leave the excess liquid to toss out. Hope this helps! It's all about the measurements really. Hi Victoria! I think a portion of your message cut off. I would love to help you if you want to clarify. So fun! I love the consistency!